Our weekend was pretty low key this time because Michael worked every day. It was pretty much just all Emily, Jexi, and me hanging out at home all weekend. I was working on my Scentsy orders too. But one thing this weekend is really sticking out in my mind. I just HAVE to write about it because, well, it's eating me up and I know it will never be seen by anyone who would be offended. One of my neighbors' elderly mother just moved in with him and she is clearly very lonely because she has latched onto me like peanut butter on bread. She wants to chat ALL THE TIME. Whether on the phone or at her house. Yes, she has had me come over to her house while Emily was napping (and Michael was home sleeping) for AN HOUR. She can't stay on one topic for more than a few minutes. She complains about her life a lot. She has said Emily shouldn't be on a bottle any more and that three out of four of her children were potty trained at 9 months old because she "didn't care for diapers." Every time I said "YEAH" instead of "YES" she stared me down until I corrected myself. I AM GOING TO GO CRAZY. I'm not a confrontational person and especially with strangers and even more so with ELDERLY STRANGERS. What am I going to do?! Ugh. I do not care for her telling me how to parent Emily and how to speak. I'm a grown woman, dang it!! But what am I going to say to her? Probably nothing. I'm trying to do the Christian thing and be nice to her, visit with her, be patient, etc. But I don't know how much I can take. What would you say or do if you were in my shoes? So what if Emily is still using a bottle? 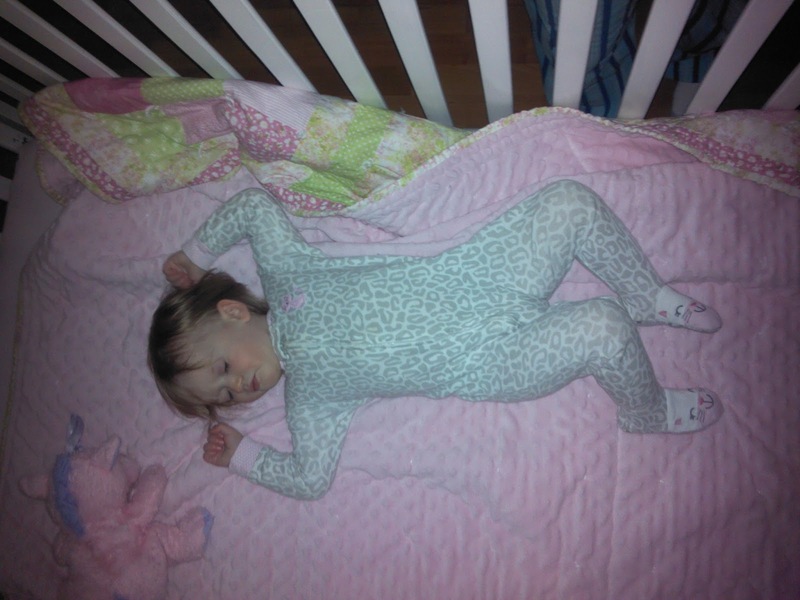 She didn't drink from a bottle AT ALL until she was about 10 months old and I finally had some freedom. She won't be drinking from it forever so what is the rush? She doesn't use pacifiers so I'm not worried about her teeth getting messed up. Babies learn things at their own pace and I'm not going to let someone try to make me feel bad about Emily not doing certain things by a certain age. 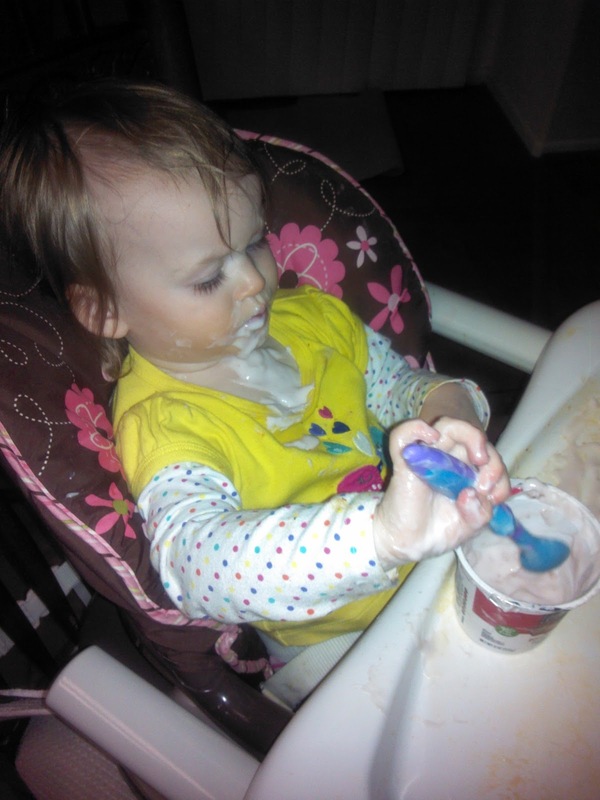 She is learning to use a spoon and I am learning to relax about her getting messy. I think we are doing just fine, thank you! Aw, Josie had those jammies! Cute. Meh, Donny still has a bottle here and there. Shhhh....don't tell your neighbor. He's 2 1/2 : ) You're doing great, btw! I don't even know WHAT I'd say, but girlllllllll, I'm sorry that you have to deal with this! Well, I am fine with being confrontational sometimes :) . So, I'd probably kindly tell her to shove it, but keep trying to keep her company when I can. 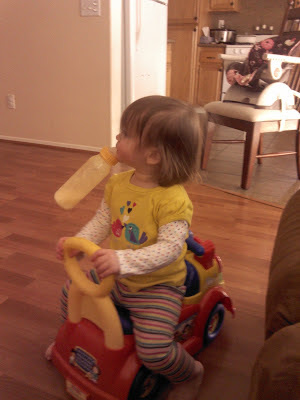 Anyway, I researched the whole bottle thing when I was nannying 2 year old twins and decided it doesn't matter too much unless they're drinking milk out of it as they go to bed (the milk is the problem, not the bottle). So GO for it. I would probably try to avoid her. But just in case you get stuck listening to her unsolicited advice, let her know that Emily is a happy, perfect baby, and that you are comfortable and confident with your parenting choices. And by the way, babies aren't potty trained at 9 months. That lady is lying or senile.